BLINK AND YOU MAY MISS the pint-sized, five-story Versailles condominium building, sandwiched between the Royal St. Andrew and the pencil-thin Echelon that’s now rising on South Gulfstream Avenue across from Sarasota Bay. But the little building brought big profits to its former owners after Seaward Development partners Patrick DiPinto III and David Hargreaves in December finished the nearly three-year process of buying out all 14 owners. Their plan: a 25-unit, 18-story luxury condo tower still to be named. While they work toward groundbreaking in the summer or fall of 2018, they’re renting out the units. The location and views persuaded the developers to make offers the owners couldn’t refuse. Wedding planner Bobbie Hicks bought her 1,629-square-foot, two-bedroom Versailles condo in 1994 for $120,000. She sold it to Seaward Development for $1,044,700. Located on the top floor, it brought a premium. A first-floor unit, in contrast, which sold for $210,000 in 2011 was bought for $725,000. While she tries to console herself with her nearly tenfold profit, others are hoping to move in. DiPinto says word of mouth has brought “dozens and dozens of realtors to us with clients that wish to purchase units.” He anticipates floorplans of 3,750 to 5,000 square feet, offered at an average of $1,100 per square foot. This article originally appeared on the Observer Website. Seaward Development is under contract to buy out the owners of the Versailles on the Bayfront for a new project. 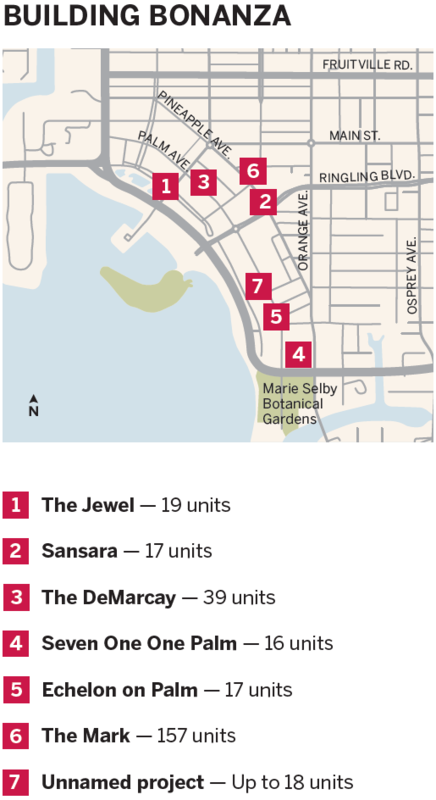 If you need any more evidence that downtown Sarasota has pent up demand for luxury condos, consider this: A local developer plans to buy out all 14 owners in a bayfront complex, and pay to knock it down — just to build a new one. Seaward Development plans to redevelop the Versailles, built in 1974, into a new condominium with as many as 25 units and up to 18 stories, according to a zoning code confirmation letter sent to the city by Seaward principal Patrick DiPinto. DiPinto, who is also developing the nearby Seven One One Palm, declined to comment until the deal with unit owners is complete. Driving that demand is the preference for living in an urban setting on the waterfront, which the corridor between Gulfstream and Palm avenues provides. Case in point: She has four buyers from Siesta Key, one buyer from Longboat and a buyer from Casey Key slated to move into the Echelon on Palm. Further, the open, flowing design buyers favor just wasn’t around before the past several years. “Even compared to the last building boom, the approach to architecture is very different now,” Drake said. Just north of the proposed Palm Avenue projects, the 18-story, 17-unit Sansara has sales pending for 15 of its residences, said Michael Saunders & Co. Realtor Jonathan Abrams. Most of those prospective buyers are “switching seasons” — as in, instead of spending a few months here and the rest out of state, they are buying more permanent residences to stay for more than eight months. 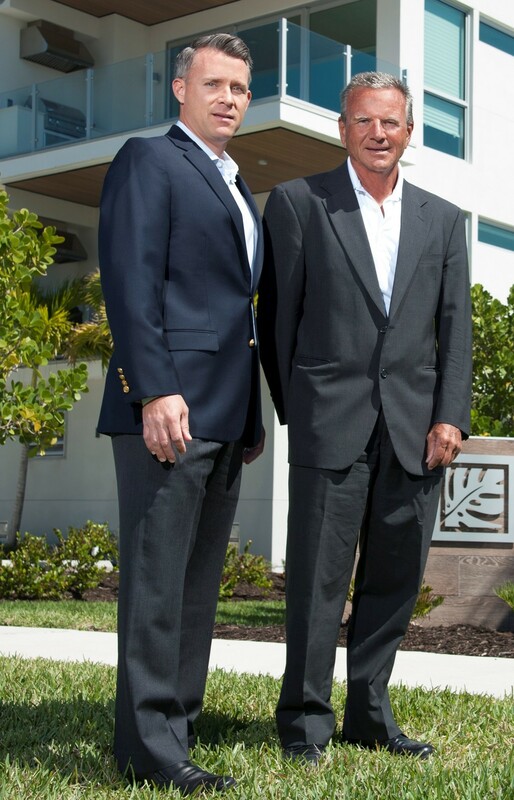 “I think that paints a good picture of the luxury buyer finding Sarasota and wanting luxury here,” he said. While luxury high-rise construction raises property values, it can create tension with nearby property owners, particularly on South Palm, where the onslaught of new construction triggered a lawsuit. In May, the Essex House Condominium Association filed a lawsuit against the developers of Echelon, complaining the construction crossed onto the Essex House property line. Before it was dismissed in June, Essex residents posted three large canvas billboards decrying the construction in front of their building. Although the Echelon construction has also affected the Royal St. Andrews condo complex — a crane dumped wet concrete onto the pool deck this summer — association manager Shelley Williams said she isn’t worried about the proposal to redevelop the neighboring Versailles building as long as contractors maintain a constant level of communication with the buildings along Gulfstream Avenue. “They came right over and cleaned it up,” Williams said, noting the construction manager had early on established a relationship with her association. There are more than 1,400 units across the city somewhere in development. That list includes large portions of Vue Sarasota Bay and Sarasota Bayside. Drake said she expects the trend toward new luxury building to continue over the next several years, but predicts it will obviously level off as construction prices — particularly the cost of building a high-rise — climbs to pre-recession levels. And don’t expect many more redevelopment projects similar to what Seaward is trying to accomplish, since Versailles is the last of the smaller condo developments overlooking the bay and therefore had fewer unit owners to buy out. “When you get into these much older bigger buildings, that’s a very challenging thing to do,” Drake said.